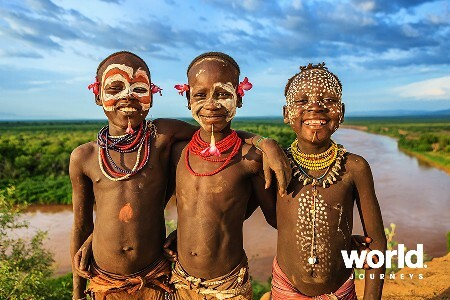 • Addis Ababa • Lake Tana Monasteries and the Blue Nile falls • Gondar • Simien Mountains National park • Ancient city of Axum • Lalibela - Rock Hewn Churches. 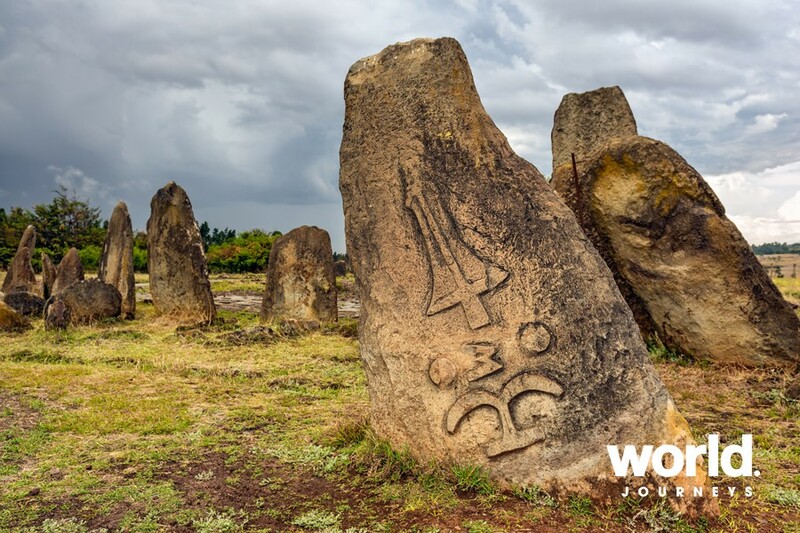 Explore arguably the continent's oldest ancient human civilisation and its rich historical past. The itinerary is tailored to suit a comfortable travel pace and you are accompanied by a professional guide all the way who will show you not only the most famous sights, but also an insight into the deep-rooted and fascinating cultural traditions that remain. Your journey begins with the city sights of Addis Ababa. Fly to Bahir Dar, where you explore the Lake Tana monasteries and the Blue Nile falls and then continue to Gondar to see the famous Royal Enclosures. 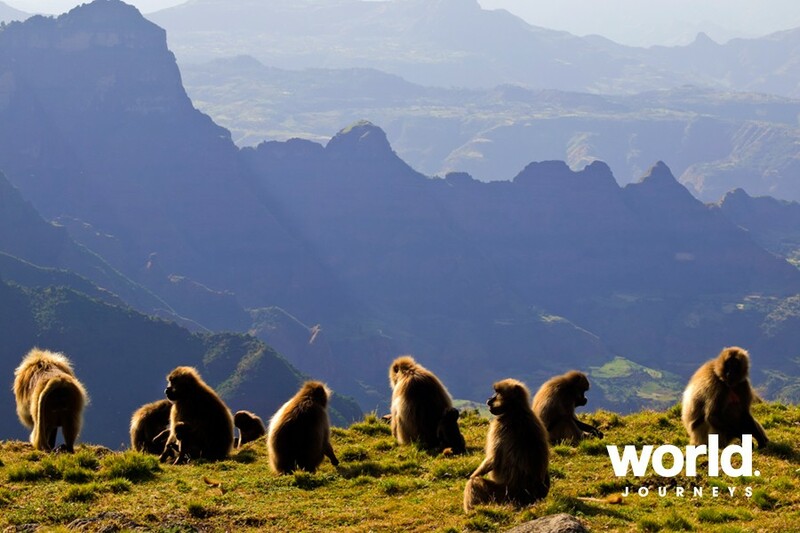 Your discovery of this historic route continues to the beautiful landscape of Simien Mountains, where can walk with troops of gelada baboons - endemic in Ethiopia. 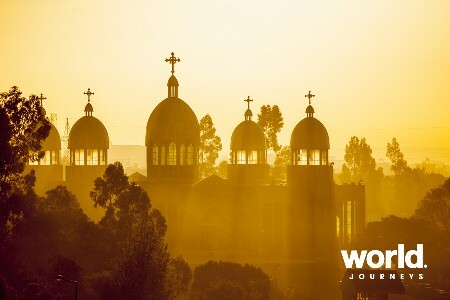 Visit the ancient kingdom of Axum with the mysterious parks and the queen of Sheba ruined palaces, and the eleven Rock churches of Lalibela, a UNESCO World Heritage site and still today a place of pilgrimage and devotion. Day 1: Addis Ababa On arrival in Addis Ababa you will be met at the airport and transferred to your hotel where you spend two nights. Day 2: Addis Ababa Your guide will show you Addis Ababa today. Founded in 1886 by Menelik II, you will start at the excellent National Museum housing some of the country's historic treasures. The collection of fossils and bones of early hominids discovered in Ethiopia include the 3.5 million year old remains of 'Lucy', the oldest hominid every found. 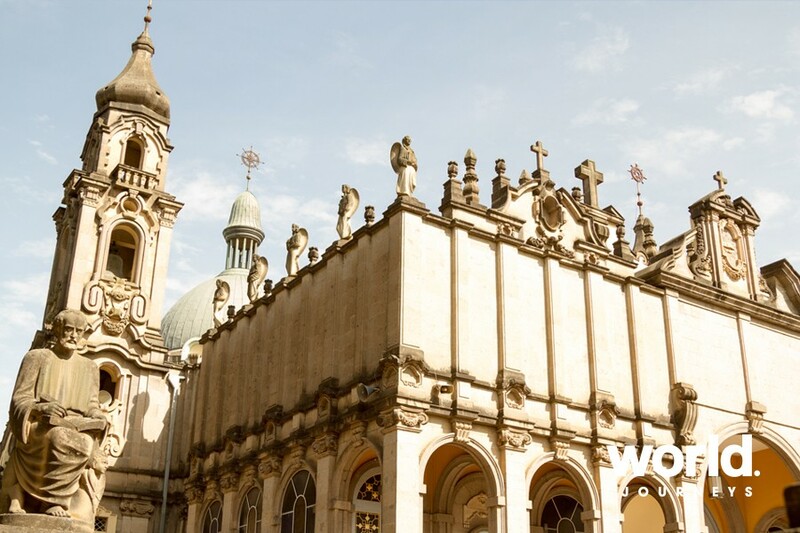 Visit two of the major highlights of the city, the Ethnographic Museum and the church of the Holy Trinity, Ethiopia's main cathedral and home to the remains of the last emperor, Haile Selassie. Day 3: Addis Ababa > Bahir Dar Morning flight to Bahir Dar, capital of the Amhara region situated on the shores of Lake Tana. Bahir Dar is one of the best well-planned cities in Ethiopia. Take a boat trip on the lake to learn the secrets held by the monasteries on the islands. Visit Ura Kidane Mihret church on Zeghie Peninsula. In the afternoon you will be taken to Tississat Falls, Amharic for 'water that smokes'. Day 4: Bahir Dar > Gondar A morning drive north to Gondar, the former capital of Ethiopia. 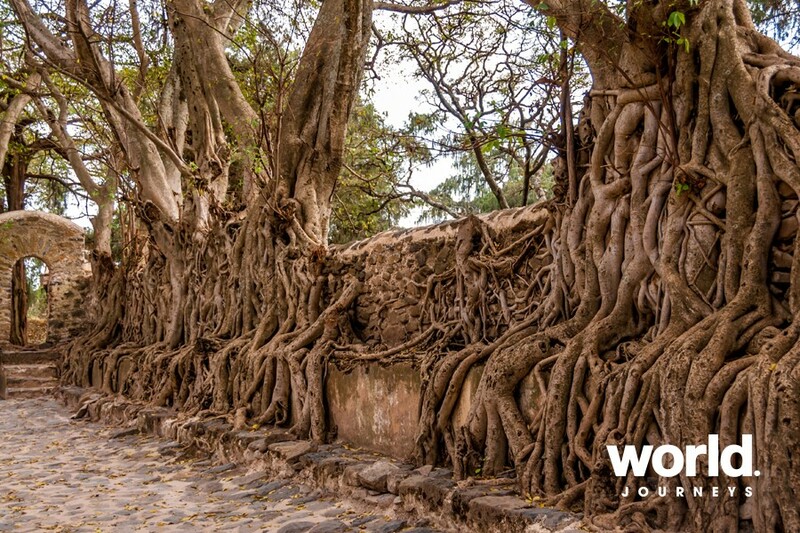 Gondar has now become one of Ethiopia's largest and most impressive cities, with its walled Royal Enclosure enclosing exceptionally well preserved 17th century castles including that of King Fasilidas. 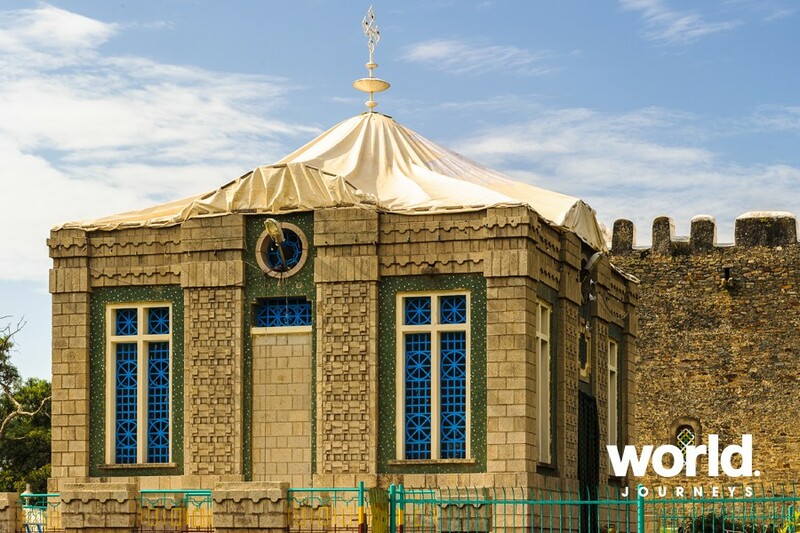 You'll also see the 'Pavilion of Delight', the Bathhouse of Fasil, where thousands of locals celebrate the Timkat Festival every January. The whole complex of buildings is unique in Ethiopia and unlike anything found elsewhere in Africa. This afternoon we'll also make a visit to the Debre Birhan Selassie Church (Light of Trinity) with its sensational angelic ceiling and mural. Day 5: Gondar > Simien Mountains National Park After breakfast drive to the Simien Mountains for some breathtaking views of this unique ecosystem. Optional 2-3 hour walk which is mostly flat or downhill, to look for the endemic Gelada baboons, klipspringers, Lammergeyer vultures, and bushbuck. Afterwards continue to the lodge for overnight. Day 6: Simien Mountains > Gondar In the morning there is more time to soak up the viewpoints in the National Park offering excellent photo opportunities of this dramatic landscape. Afternoon drive back to the city of Gondar. 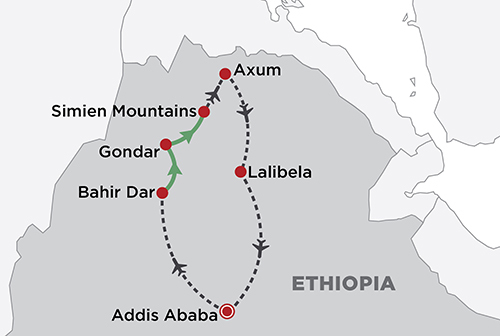 Day 7: Gondar > Axum Today you will fly to Axum, the seat of the ancient capital of the Kingdom of Axum, which was once one of the most powerful in the ancient world. Located at the centre of the trading routes between the Mediterranean and India, and the great port of Adulis on the Red Sea, it was economically, politically and technically advanced and at times had control over both sides of the Red Sea. Axum is also the origin of Christianity in Ethiopia and believed to be the resting place of the Ark of the Covenant. The old church of St Mary of Zion was the first church to be built in Sub-Saharan Africa around 330AD. Its ruins can be seen in the precinct of the church compound. 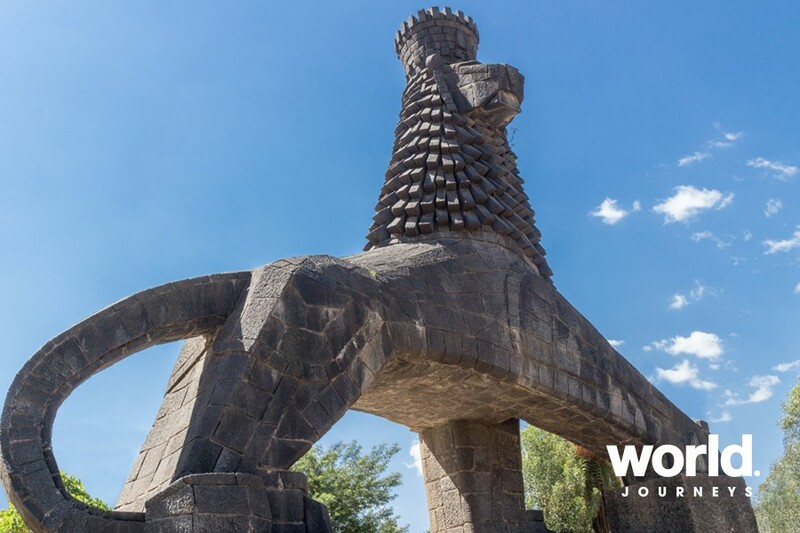 We visit the famous monolithic stelae of Axum, the tallest one still standing reaches over 21 metres and the greatest one of them all, once 34 metres high now lies toppled on the ground. However, it is still the largest monolith ever erected by man. The subterranean tombs, stone inscriptions of ancient Axumite kings and the small archaeological museum are also living witness of the ancient Axumite history. We will also visit the ruined palace of the Queen of Sheba who is said to have given birth to Menelik the First, fathered by King Solomon, the founder of Ethiopia's ruling family until the late Emperor Haile Selassie. Day 8: Axum > Lalibela Early flight to Lalibela where we will visit the first cluster of rock-hewn Churches. 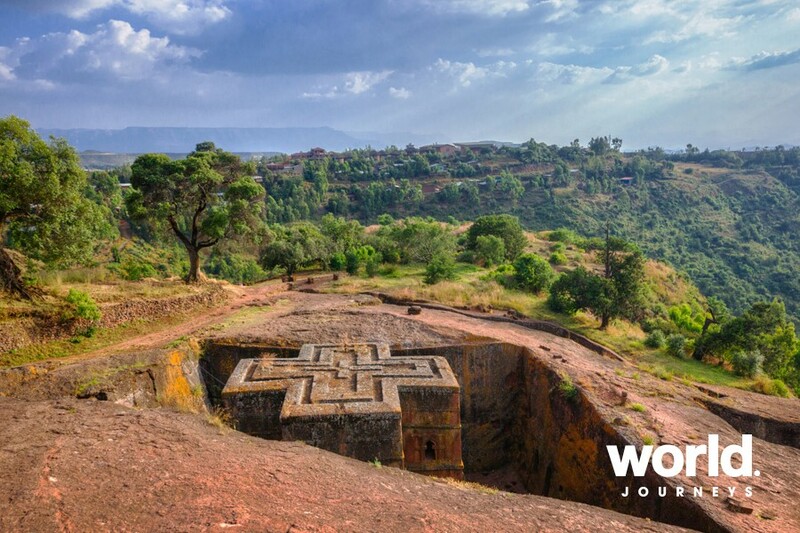 Lalibela, the 'New Jerusalem', is thought to have been constructed some 800 years ago by King Lalibela. Lalibela was his capital city, but today it is a small village. Although churches carved in rock are found in other parts of the world, those found in Ethiopia are particularly interesting. Generally, they were excavated on all sides of a rectangle, leaving a large block of granite isolated in the centre. This rock was then shaped and formed both inside and out and the carvings show extremely skillful workmanship and they have been classified as one of the wonders of the world. Each church has a unique architectural style and all are superbly carved. There are 11 rock-cut churches of which the most impressive is Bet Giorgis. It is carved in the form of a Greek cross and exceptionally well preserved. Day 9: Lalibela Today we will visit the exquisite church of Yimrhane Kristos, a masterpiece of Axumit wood and stone construction, renowned for its interior decoration, it's beautiful wooden coffer ceiling inlaid with hexagons and medallions with both figurative and geometric motifs. In the afternoon, we will visit the remaining rock-hewn churches of Lalibela that include the churches of Bete Gabriel and Rafael, Merkorous, Emanuel and Abba Libanos. The rest of the day is spent absorbing the atmosphere of this extraordinary town with its Tukul or round houses. Enjoy a coffee ceremony and tasting of the local honey wine drink with your guide while in Lalibela. Day 10: Lalibela > Addis Ababa Flight back to Addis today and spend some time shopping and in the evening enjoy dinner at a fabulous traditional restaurant with traditional dancers. Evening transfer to the airport. Depending on your flight schedules it may be required to spend another night in Addis Ababa. Prices are based on private touring, with a minimum of two people travelling together. Single rates are based on travelling with others in your party but staying in a single room, please enquire for single travel solo rates.